Producer and composer Steve Levine, most famous for his work on Culture Club’s studio albums, was commissioned to recreate the classic sound of 1960's soul for Audio Network, which licenses production music for film and television. 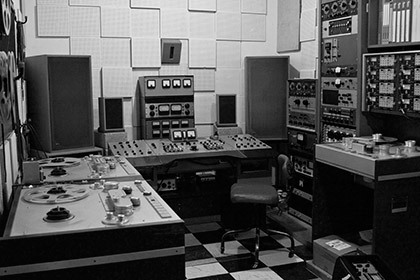 In order to capture the vibe of the era, Levine employed specialized vocal talent, '60s-era recording equipment, and even modern gear that embody vintage characteristics, including UAD Powered Plug-Ins. Read on to learn how to capture the Motown-style soul sound with the help of Universal Audio’s faithful emulations of classic vintage gear —including the Fairchild 670 and Studer A800 Tape Recorder. I was commissioned by Audio Network to produce a very interesting and intriguing project — to record as well as capture the vibe and sound of an authentic soul recording session from the mid to late 1960’s.The recording wasn’t meant to be specifically a Motown, Stax, or Atlantic Records soul sound, but was meant to sound along the same lines — as if we were in a parallel universe. I’m not old enough to have been making records in the 1960’s (I was born 1958), but I knew from my radio series, The Record Producers on BBC Radio 2 and 6 Music, that Motown Studio had 8-track recording facilities from 1965 onwards. The majority of what we all love as the “classic Motown sound” —The Four Tops’ “Reach Out,” or The Supremes’ “Reflections” and “Can’t Hurry Love” — were all 8-track recordings. Motown, Atlantic, and Stax Records had all used 8-track recording well before the Beatles had access to that hallowed high track count. Legendary songwriter Lamont Dozier and Motown Records actually supplied me with copies of some original Motown multitracks for the series. Having access to the original multitrack tapes gave me a unique insight into how those records were made. Along with the incredible musicians that the producers used, I also understood how cutting-edge and creative the recording engineers were, especially for the time. Having drums and bass on separate tracks, overdubbing the lead vocals separately from the background vocals — these decisions gave them unprecedented mixing control for the era. For the most part, the UK was still using a 4-track; having an 8-track helped create the tight, soulful sound. The Right Studio, the Right Musicians, the Right Vibe. Toe Rag Studios in London, England. To successfully recreate this unique sound, the key for me was to book the right studio and the right musicians. Luckily such a studio exists in London: Toe Rag Studios. They have a 1-inch Studer 8-track tape recorder, as well as an EMI REDD mixing desk. Whilst this tape machine is from the '70s and the EMI REDD mixing desk is from the early '60s, it was close enough for our purposes. The recording room was very close in size and style to Motown's studio and the tracking sessions took place over a week. I tracked drums, bass, and guitars as the basic tracks, having first routed all the songs with the vocalists prior to tracking. I used vintage microphones where possible, but also new vintage mics such as the Audio Technica ribbons (AT4080 & AT 4081s). They were most successful in capturing a great drum sound — just one overhead and one on the bass drum. Toe Rag has a real vintage EMT 140 Plate Reverb, so I managed to emulate the settings for my EMT® 140 Classic Plate Reverberator Plug-In. This helped the string players and the vocalists get the vibe. You can download the preset I saved for the EMT 140 here. 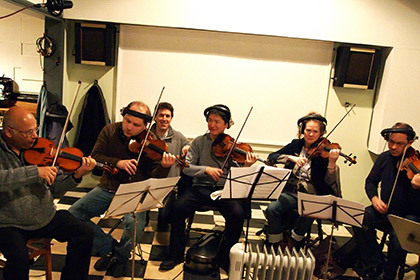 String recording session for “Just Give Me A Chance. After the backing tracks were recorded, guitar overdubs, handclaps, and percussion (vibraphone, tambourine, congas, etc.) were overdubbed. All tracks were recorded through the EMI console and onto the Studer 1” tape machine to create the sound.After the eight tracks were all used up, I decided not to make my life more complicated by having multiple instruments on the same tracks. I transferred the master tapes into my laptop, and recorded the string and horn overdubs directly into my laptop. UAD plug-ins were used extensively during the mixing phase, and this song is no exception. The main plug-ins I used during mixing were the Pultec Pro EQ Plug-In and the Fairchild® 670 Compressor Plug-In, as they were used extensively on many Motown recordings from that era. Thanks to the Studer® A800 Multichannel Tape Recorder Plug-In, I was able to create the same overdriven tape sound of many of the '60s era soul recordings. For the strings in “Just Give Me A Chance,” I used the Neve® 1073 Classic Console EQ Plug-In, dbx® 160 Compressor / Limiter Plug-In, and the Studer A800. You can even download the presets I used here. The lead vocals were the most impressive – adding reverb from the EMT 140 to the Studer A800 plug-in drive really brought out the growl on Kevin, the lead vocalist’s voice — very LEVI STUBBS! You can download the Studer preset I used for the lead vocals here. After hearing the difference UAD plug-ins made in the mixing stage, Audio Networks’ mastering engineer, Christopher Brooke, purchased a UAD-2 Quad card, and used the plug-ins to master the album!